I love taking photos and if only I will have time I would like to study photography to enhance whatever skills I learned from years I’ve spent on photo hobby. Since I started blogging five years ago I became serious with learning the craft because it’s also helpful in maintaining my blogs. It’s a must for bloggers to have at least 1 functional and quality digicam to use on various sites especially on joining exciting photo meme. As my friend quoted us ‘a blogger is always associated with write-ups and photos’ because it makes for a nice and well-written presentation of quality posts. With the fast trend of changing technology I’m not surprised to see some companies that offer software and gadgets that can perfect your photo shots. I just had some tests on the new online image resizer I browsed at Reshade. The idea is that you can resize your favorite pics online professionally with their help. Reshade provides quality and accurate photo enlargement method for your PC and is said to be better than Photoshop or other editing tools for images. It’s a good photo resizer for your images that needs enlarging without losing the quality and good texture of the original image. Since it offers unlimited zoom you can work your way with your own picture that’s too small for your layout without worrying that it will produce blurred and not so sharp picture results. 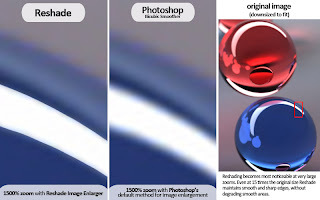 Reshade provides choices whether you want online image resizer wherein no download is required or you want to do it using windows application where it’s readily available on your desktop. Both gives quality pictures maintaining the sharp quality, clear resolution and high grade texture you would love to have in your favorite picture. It’s also convenient and quick as it works in multiple images, it can crop and process pictures in batches. This will surely be of great help to photo enthusiast like me who does not only get high resolution pictures from their shots but the perfect editing tool for enlargement as well.